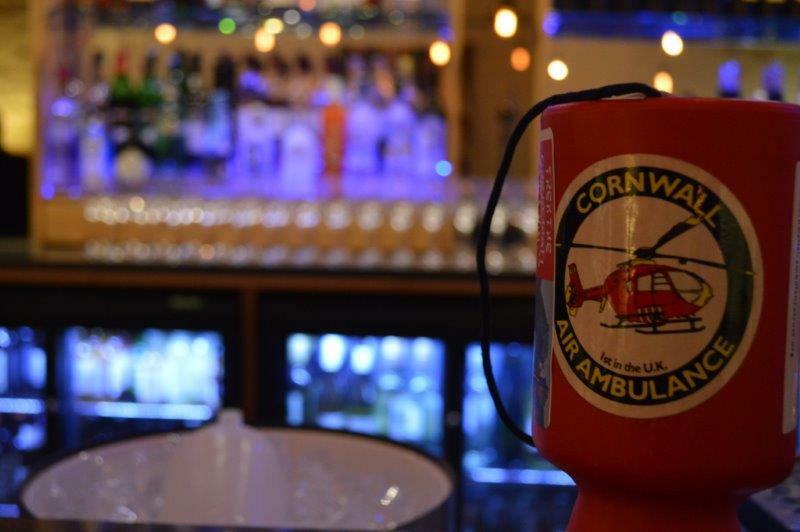 On Sunday 8th March, our Porthleven restaurant hosted a charity auction for Cornwall Air Ambulance. Organised by Annette Shaw, the restaurant was filled with locals eagerly waiting to bid on items that had been kindly donated by local businesses including Jo Downs, Seasalt, Tarquin’s Gin and Padstow Seafood School raising a total of £2,200. Guests enjoyed four courses from the head chef Simon, including grilled chicken paillard with watercress and red wine dressing and smoked haddock with poached egg and potato bhaji. Annette has organised several events throughout the evening including a lucky ticket draw, a heads and tails game, a draw for a family swim voucher and an auction hosted by David Carlisle from Cornwall Fire and Rescue. The biggest surprise of the night came in the form of a phone call from a Yorkshire gentleman who had been holidaying in Porthleven when he had a heart attack. The Cornwall Air Ambulance service came to the rescue and after seeing the Twitter activity surrounding the event placed the top bid of the night on a day for two at Padstow Seafood School to show his support to the organisation. For more photos from the night take a look at our Facebook page.